For a long time, drones were big and bulky, and taking them with you on your holidays was impossible. To take the best travel drones with you on a plane was very difficult, if not actually impossible. But times have changed. Drones are getting smaller and lighter with every new generation. The smallest of them even fit in your back pocket. And even though drones have become smaller, the technology and camera quality has become more refined. These days, you are not depending on a plane to see the earth from a birds view. When you travel with a drone, you get the chance to see the world from above, which is absolutely amazing! The pictures and videos you can shoot with a drone are absolutely breathtaking and will definitely step up your holiday photo game. We love to have our drone with us when we travel. During our 9 months in Asia, we shot some great pictures with it. To help you decide which drone for travel you should buy yourself, we created this article to present to you the 10 best travel drones currently on the market. Let’s begin with the best travel drone we have in our own Travel Photography Setup, the DJI Spark. The DJI Spark is in our opinion one of the best affordable drones and we are more than happy with it. With a take-off weight of only 300g and its small size, this mini-drone is very light and easy to carry around. In fact, we carried it in our small backpacks during our 9-month trip around Asia. If you can live with the fact that the DJI Spark “only” shoots in a 1080K resolution, then the DJI Spark can be one of the best drones to buy for your next holidays. Because the price is comparatively low and the quality of the drone is very good, the value of the DJI Spark is great. This fantastic little drone will definitely enrich your next holiday pictures. Before there was the DJI Spark, there was its big brother, the DJI Mavic Pro. At the time of its release, the DJI Mavic Pro was probably the first compact semi-pro travel drone. It’s a lot smaller and lighter than its predecessor model “Phantom”. Also, you can fold in the propeller arms, which makes it perfectly suitable for travelling. The DJI Mavic Pro is superior to the DJI Spark in most aspects except two. First, it is bigger and heavier than the Spark. Second, it is quite a bit more expensive than its smaller brother. This drone has a range of about 7000 meters! The DJI Mavic Pro is still one of the best photography drones for travelling if you have the required money and the pack-space. The quality of its footage is amazing and you can keep it in the air for a long time. Flying with this drone will definitely bring you loads of fun! Recently, DJI released the upgraded version of the Mavic. Or better said 2 versions! They improved the camera quality, added some fantastic new smart modes and made the pictures look brighter than with the old version. While the Mavic 2 Pro scores with 10-bit HDR video, a built-in Hyperlapse mode and adjustable aperture, the Mavic 2 Zoom has a built-in 2x optical zoom lens. If you want the best consumer drone on the market, you’ll have to decide for one of those two drones. They do come with an increased price though. If your budget is not that high, then you’ll be better off with the DJI Mavic Air. The DJI Mavic Air is at the time of writing this article the best portable travel drone on the market. DJI took the technique and the foldable rotor arms from the Mavic Pro and the small size from the Spark and improved them. Consequently, this is the perfect drone for travelling. If you want to buy one of the best-rated drones on the market, this is your best bet. The DJI Mavic Air is the perfect love-child between the Mavic Pro and the Spark. Great footage, smooth steering, very compact. If we didn’t possess a DJI Spark already, we’d definitely go for a Mavic Air, as it is one of the coolest drones on the market. The Yuneec Breeze 4K is one of the best selfie drones for an affordable price. While it lacks a gimbal for serious aerial photography, it still shoots in a 4k resolution. In our opinion, it is more than a selfie drone and perfect for beginner drone pilots who don’t want to spend hundreds of dollars on a drone. While the technique and power of this small travel drone don’t reach the level of the top products on this list, the affordable price and the beginner-friendly navigation make the Yuneec Breeze 4K an interesting choice for a drone novice. Also, it is one of the best drones under 300$. The Hover Camera Passport is probably one of the best travel drones in terms of compactness. You can fold this great drone down to a cuboid with the size of 182x132x33mm. The clever design even won several prizes and awards and puts this drone into the category of “cool drones”. 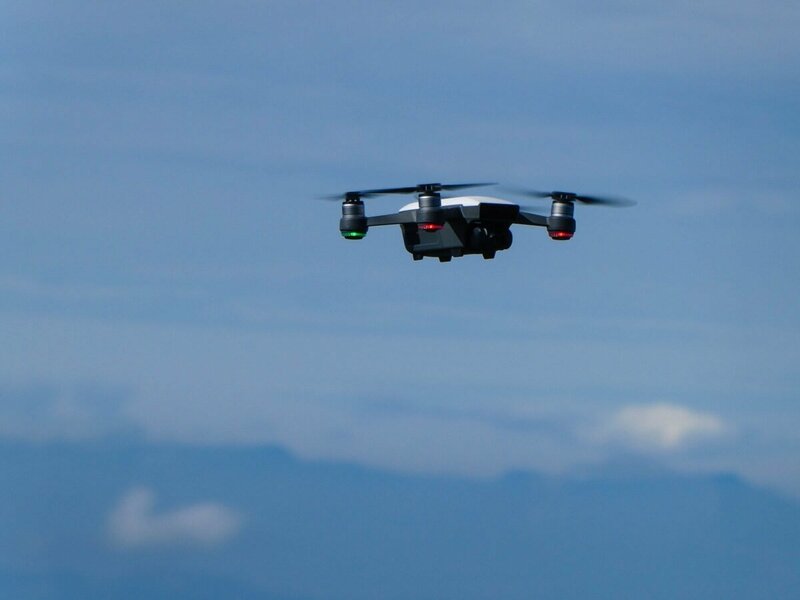 While the Hover Camera Passport is not suitable for flying long distances, it is still one of the best portable drones for selfies on the market. It is the best travel drone for people who mainly shoot selfies but still want a great quality and a good resolution. When Europe’s biggest drone manufacturer Parrot built the Anafi drone, they had the insect anatomy as an inspiration. The Parrot Anafi is a proper rival for the DJI Mavic Air and one of the best-rated drones with camera on the market. Above all, there is one thing that really differentiates the Anafi from all the other drones. The camera, which is mounted on the front of the drone, has the novelty possibility to shoot film pointing upwards. The Parrot Anafi is a great rival to the DJI Mavic Air and definitely one of the best 10 drones for travelling. Especially with the cheaper price, it is a very attractive offer. That said, the Anafi is not the perfect drone for a beginner because of its lack of an obstacle avoidance system. However, it’s still one of the best travel drones on the market. With the GoPro Karma, GoPro tries to expand to the drone market. The Karma comes with a GoPro Hero camera which is attached to the drone with a gimbal. Consequently, this gives all your photos and videos you shoot a fisheye look. With more than 1000g, it is also the heaviest of all the best travel drones on this list. If you’re a fan of the GoPro fish-eye photo and film style, then the GoPro Karma might be one of the best drones for travel for you. As the GoPro camera is detachable, you can perfectly use it for other adventure activities. Also, the bundle you get when buying the GoPro Karma has a really great value, especially because of the included gimbal. The JJRC H37 Elfie is from a technical view the weakest drone in this list. Therefore, it is also the cheapest drone of the 10 best travel drones. With the 4 arms folded in, it is not bigger than a large smartphone and weights only 58g. This makes it one of the lightest and best drones under 200g. in this article. You control the drone with an app (available for ios and android phones). Even though the JJRC H37 Elfie is comparatively small and cheap, it still includes an altitude hold and a one-key return. The JJRC H37 Elfie will definitely not win any prizes for technical advancements. But because of the very low price and the super small size, we still include it in our list of best travel drones. Finally, this is one of the best selfie travel drones and recommendable for everyone who’d like to take occasional dronies (selfie taken with a drone). The Zerotech Dobby Selfie Drone is a mix between a high-class amateur drone like the DJI Mavic Air and a selfie drone like the JJRC H37 Elfie. This smartphone-controlled drone weights only 200g and is foldable, so you can carry it in your back pocket. It shoots in a 4k resolution and films in a 1080k resolution. All these features make it one of the best foldable drones for travelling. This little selfie drone comes with an almost unreserved recommendation for everyone who wants to have an upgrade from a pure selfie drone, but don’t want to invest in the likes of DJI or Parrot. The only thing that really lets this drone down is the short flight time. That said, it’s still one of the best budget drones for travelling. The Wingsland is another drone in the mid-price range. Most of the specs are almost the same as the Dobby, except the slightly longer flight time. The main difference is, that the S6 is currently one of the thinnest selfie drones on the market. This makes it one of the best compact drones out there. It’s the perfect travel drone for your back pocket. The Wingsland gets often compared with the Zerotech Dobby Selfie Drone. This is mainly the case because they are both in a similar price range and have similar specifics. If you can afford it, we recommend upgrading to a DJI or Parrot drone. If you can’t afford it, you have one of the best mid-range travel drones in form of the Wingsland S6.